When it comes to choose the right lip gloss that match your complexion and look super natural to wear all day long, I only choose the well-known brands because lip gloss is a product we use in our daily routine so it should be good quality that gives perfect coverage with healthy glow and nourish the lips at a same time. 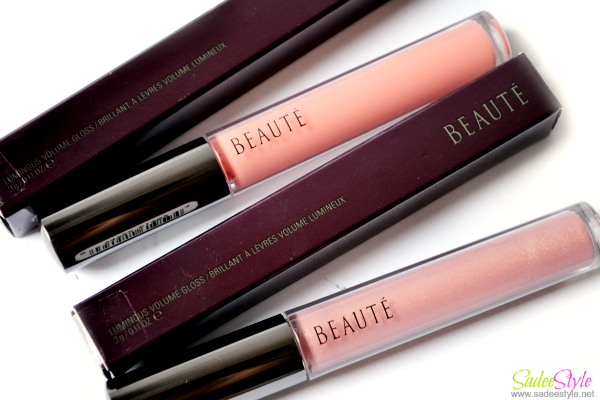 In so many options I have chosen a BEAUTE Luminous Volume Gloss. It comes with twelve different shades, all shades are super pretty and made to match all complexion and skin tones. I've IF and Paramour. IF is a natural soft peach shade which compliment all kinds of complexion. I'm a light skinned girl, it suits me perfect and look so flattering. Wear it alone or over lipstick, it gives a same healthy glowing effect and volumize lips. It flatter on me and hydrate lips at a same time while Paramour is a metallic rose shade with hint of gold. I'm highly impressed with the creamy texture of the gloss which feels super smooth on lips and appreciate it's very right consistency that doesn't feel so thick neither so sheer. It stays and settle perfect and one do not need to reapply it again and again. A color of both lip glosses are natural and give healthy glow, probably a perfect for everyday use. It's super smooth and silky texture glides smoothly on lips without feeling sticky. I love the ultra light formula feel so creamy and amazingly do not smell so loud. It literally provides full coverage and glowing shine on lips and lips stay hydrate all over the day. It has become my favorite lip gloss since the day I'm using it. Definitely a perfect range of lip-glosses. Does not melt or fade. It can be used as a simple lip-gloss or over lipstick to add a healthy shine. Amazing natural range of shades. A Perfect shape tube with long brush which make application convenient. I've not found any except its a bit pricey. Although its price is quite high as compared to other lip-glosses around, but it's really worth the price. I'm so glad that I have used it and I would definitely repurchase it. I would recommend it to others. It's a perfect lip-gloss that everyone needs in daily routine. 26$, Can be order from their official website.